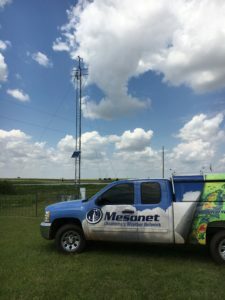 The Oklahoma Mesonet was created in 1994 to serve Oklahoma citizens, support state decision makers, enhance public safety and education, and stimulate advances in resource management, agriculture, industry, and research. The network consists of 121 automated stations, at least one in each of Oklahoma’s 77 counties. At each site, the environment is measured by a set of instruments located on or near a 10-meter-tall tower. The measurements are packaged into “observations” every 5 minutes, then the observations are transmitted to a central facility every 5 minutes, 24 hours per day year-round. During the past 40 years, the University of Oklahoma has developed a world-renowned program in the atmospheric sciences and is a recognized leader in research, development, and application of science and technologies to monitor and forecast hazardous weather and climate. They also operate the “gold standard” for mesonets and proactively assist other domestic and international organizations establish monitoring networks of their own.